The reboot is obviously trying to connect to a new generation of kids who will be just as thrilled as the Millennials who grew up with the franchise. The plot is simple and pretty straight forward with the turtles who have been living in the NYC sewers most of their lives training to become the caretakers of the world by way of the intense ninja training they received by their adopted father Splinter the rat (Danny Woodburn/Tony Shalhoub,voice). The critters were mutated in a laboratory accident by a serum that made them larger and invincible. Years later the turtles now typical teenagers, except for the fact they are super large bipedal turtles, that are mutant and ninja's: Leonardo (Pete Ploszek/Johnn Knoxville voice), Michelangelo (Noel Fisher), Donatello (Jeremy Howard), and Raphael (Alan Ritchson). They are witnessed by April O'Neil (Megan Fox) who sees them fighting the Foot Clan who have been threatening the city. April wants to do some hard stories than the fluff she's usually assigned. Her boss Bernadette Thompson (Whoopi Goldberg) fires her when April tries to convince her of what she saw on the rooftop. She manages to enlist the help of her wisecracking cameraman Vern (Will Arnett) to investigate the story with her. You just know that when you see William Fichtner as Eric Sachs, the rich guy who tells the city he's trying to get rid of the Foot Clan, is a bad guy the minute he speaks. He used to work with April's father at his laboratory. It was April who helped free the lab animals when it caught fire and killed her father. 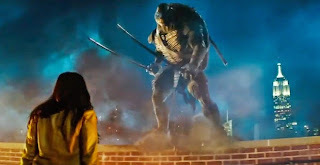 Sach's needs the blood of the mutant turtles to create an antidote to the poison mutagen he plans to release on the city in order to become rich, and allowing his mentor robotic Samauri Shredder the will take over the city. There are battles galore, quick verbal sparing from the turtles on the half shell, and the intrepid April and Vern all trying to save the day. Kids will have a good time with this film. But running against Guardians of the Galaxy it will be a hard sell.